Size 3'10" x 5'4"5'4" x 7'8"5'4" x 7'8" Oval7'8" x 10'9"7'8" x 10'9" Oval10'9" x 13'2"
You can find animals, flowers, and trees on the Kids Area Rug! 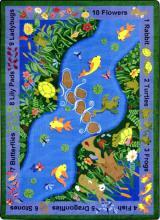 Your young students will take great delight in seeking, matching, and counting the animals, flowers, and trees shown in the border of this stunning carpet. A stream cuts through the carpet, adding many more objects for your class to identify. The Kids Area Rug is a great teaching tool for phonetics development and science knowledge. You can use the rug for quiet time, class lessons, or interactive learning sessions. You want longevity with any classroom carpet or rug that you purchase. 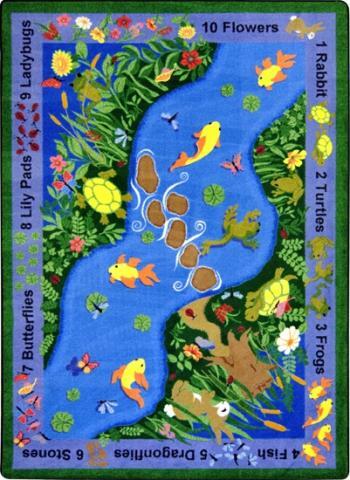 We construct the Kids Area Rug with tightly woven nylon fibers that bond together to provide maximum support. Teacher rave about how this rug handles rambunctious children. The resilience of this rug includes superior fade resistance that we create through the use of Colorfast. Your new carpet will remain intact for years and provide your students with many colorful memories.